These SEO tools are some of the most interesting and least spoken about in the online groups and among leading marketing consultants. They are invaluable to my own workflow. I’m sure once you check them out, you’ll agree. Most of these tools are free but the paid one’s are worth 1,000s in gained productivity. These are some helpful tools to leverage your content. It’s important to write useful and honestly but there are also tweaks which help the SERPS recognize that you have a certain purpose. 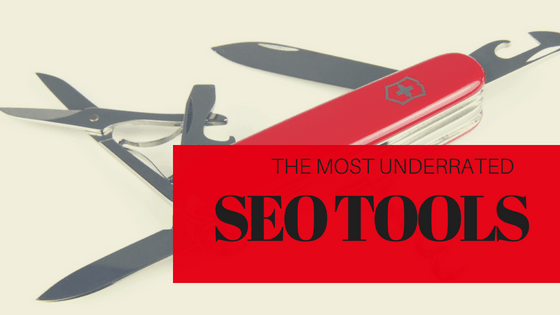 These SEO tools will enable you to achieve a better result. This is perhaps one of my favorite SEO tools ever. Although there is no consensus about how Google uses TF*IDF or LSI content. There are patterns that top-ranked websites exhibit in their usage of keywords. Seolyze gives an invaluable report of the top 10 results for a given keyword, in multiple languages no less. 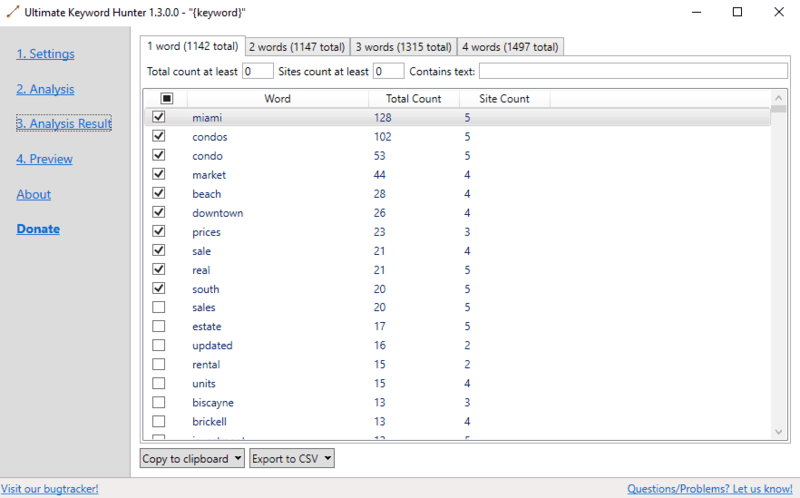 Enter your keyword and your website to check how they stack up against the current top 10. 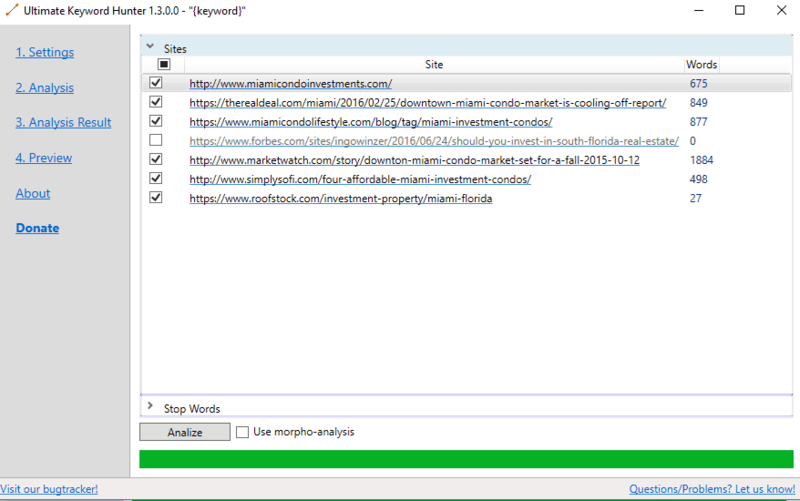 Seolyze checks meta data, how often a keyword is used, the citations for each site, backlinks, and LSI content. It lets you know which words you are overusing and which need to be added more frequently. Of course, some of the suggestions are brand related so it’s not perfect but it’s a real production hack for SEOs who are trying to optimize their on-site content to increase rankings. Pros: Very deep analysis of the top 10 for a given keyword. Cons: Server often gets overloaded with only two or three searches a day and the cost is a bit on the high side for what it does. All I can say about this little gem is, WOW! Finally, a writing productivity tool which actually guarantees your articles are optimized with LSI content. Before discovering this tool I had to make a checklist of words and do an in-line search checking off each and every LSI word I needed to add. Now it’s done for me, almost, automatically. 2. The software makes an analysis of competitors and identifies the LSI content. 3. The LSI content suggestions are made based on SERP result ranked competitors. 4. Write or import your own article and the suggestions are given to you with ratio data right on the page. 5. Write directly into your article adding the missing LSI words and they are automatically checked off. 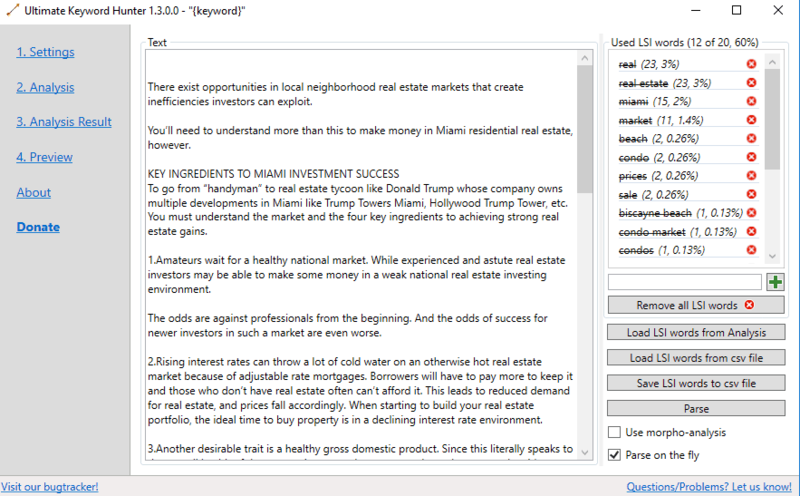 Pros: Free LSI keyword solution that works offline. Cons: Interface is dated and there’s no support (deprecated program). There are helpful apps and then there are apps that make your life complete. The Hemingway app is one of these indispensable solutions. The Hemingway app fixed up my clumsy grammar, reduced the reading level for both readers and the Google bot. 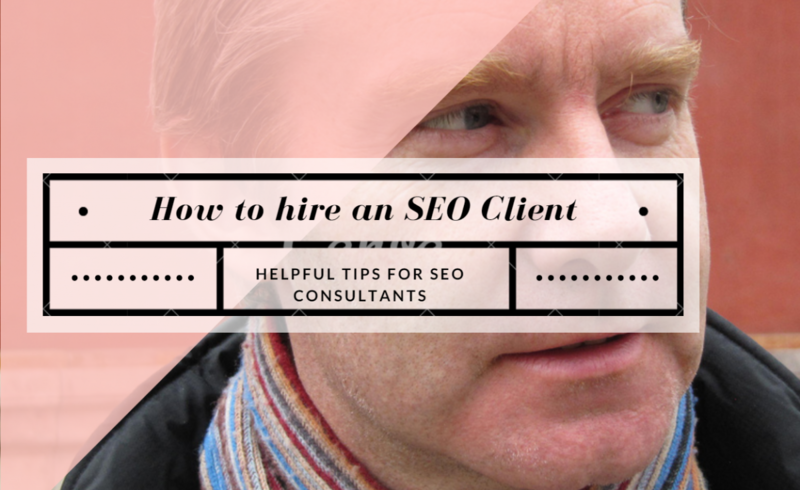 This is the perfect SEO solution for content optimization. This “app” changes everything. I’m not sure why they haven’t done a wordpress plugin yet as this would be a very popular choice for bloggers the world over. The software checks your grammar and the reading level of your text. I was able to reduce the writing level from grade 9 to grade 8 while adding many new phrases to make this more clear to both readers and to the Google bots that crawled the page. Now they know, on an 8th-grade level, what this article is about! I’m a huge fan. And you will be too once you get to know Hemingway on your laptop. Check it out here. Pros: Completely free and browser-based. Works as well as Grammarly with some very intuitive suggestions about content that are very SEO friendly. Cons: Cut and paste is a bit tough as you have to remove the html code from the text if you are editing rather than working from a first draft. Basically you have to edit paragraph by paragraph. A plugin for WordPress will fix this. 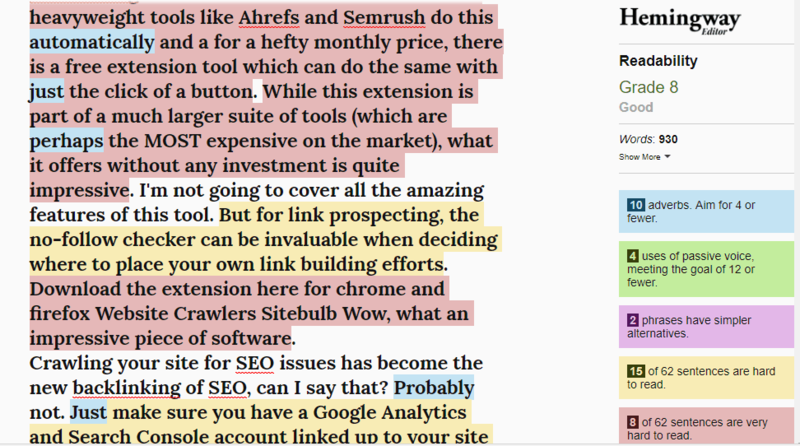 While the heavyweight tools like Ahrefs and Semrush do this automatically and a for a hefty monthly price, there is a free extension SEO tool which can do the same with just the click of a button. While this extension is part of a much larger suite of tools (which are perhaps the MOST expensive on the market), what it offers without any investment is quite impressive. I’m not going to cover all the amazing features of this SEO tool. 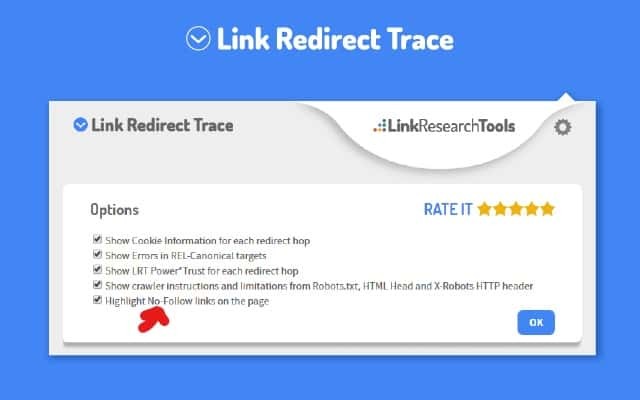 But for link prospecting, the no-follow checker can be invaluable when deciding where to place your own link building efforts. Wow, what an impressive SEO tool. Crawling your site for SEO issues has become the new backlinking of SEO, can I say that? Probably not. Just make sure you have a Google Analytics and Search Console account linked up to your site (don’t know what those are yet? You need to head over to our most common SEO questions FAQ and learn how these free Google tools can give you an amazing wealth of info). This is just the surface of what the software does, and it’s not particularly unique, Screaming Frog can do all of this too. What it does have going for it is an incredible founder SEO evangelist with a decent sense of self-deprecating humor which is very refreshing. Download Sitebulb SEO web crawler software which is in healthy beta at this point. 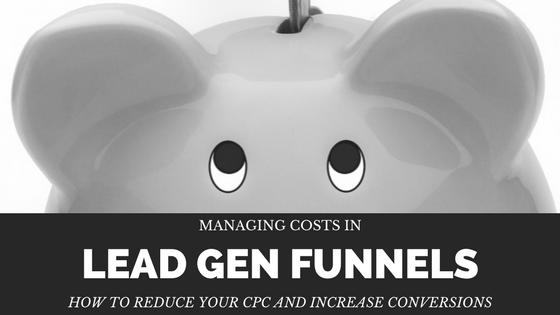 It’s a little expensive for the really impressive features like the visual sitemap linking features. 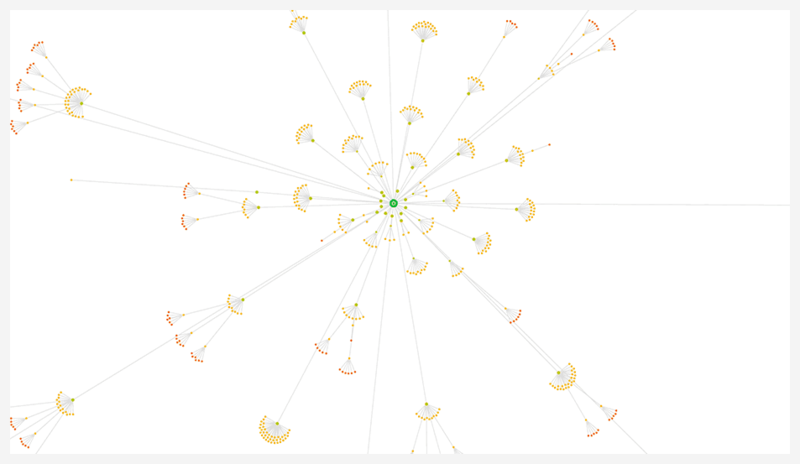 This is the actual visual “crawl map” of a website crawled in the Sitebulb software. It shows the primary links between pages. 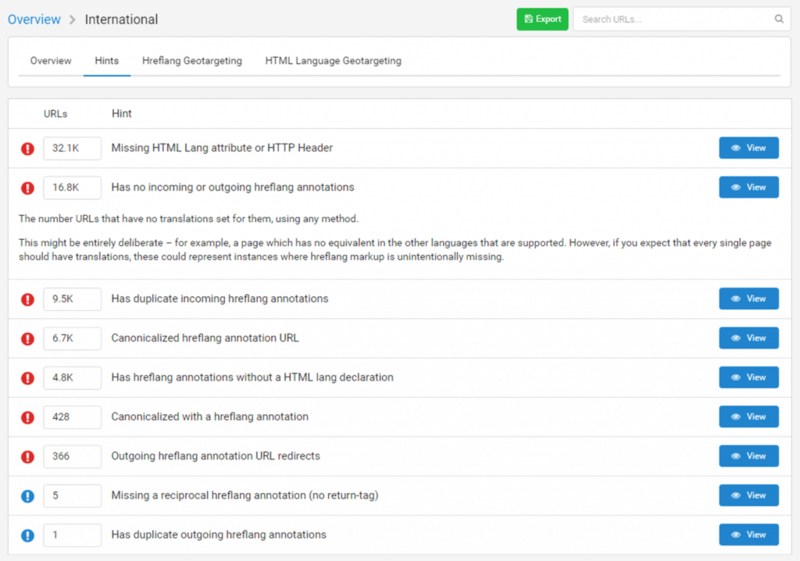 It should be mentioned that the full-featured version is a little expensive for the really impressive features like the visual sitemap crawler (“crawl map”). However, just like Screaming Frog SEO software, Sitebulb also has a free version limited to 500 pages on-site. 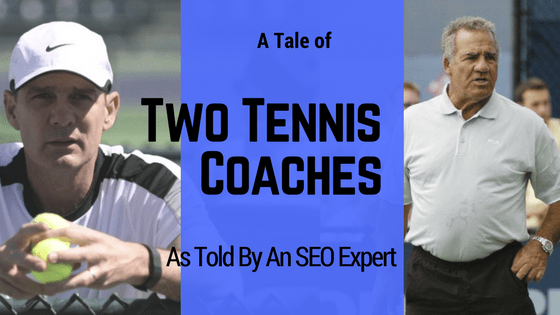 If you are serious about perfecting your on-site architecture and giving google zero reasons to not rank you at the top of the queue, this is a big leap forward in deep SEO analysis. If you are serious about perfecting your on-site architecture and giving google zero reasons to not rank you at the top of the queue, this is a big leap forward in deep SEO analysis. Enter your keyword and get a suggestion to help you save money! This SEO tool was a surprise. For years I had been compiling my own list of negative keywords for both google adwords and Amazon listings. Now I see there is a very convenient tool which outputs the list for me in seconds. 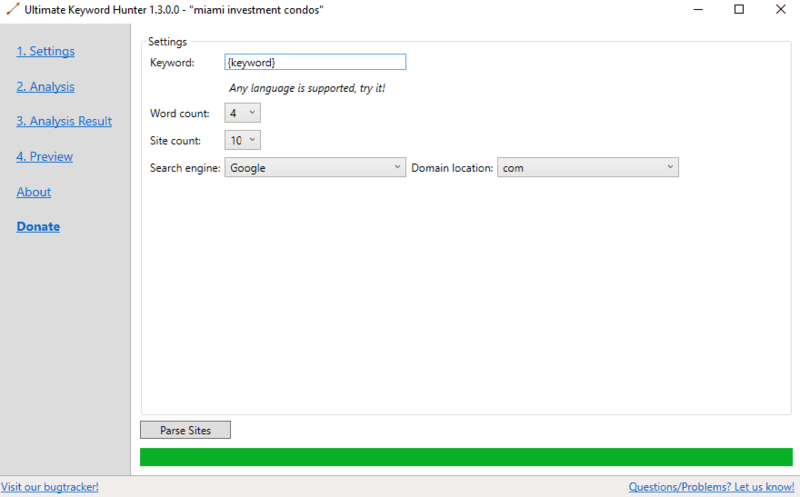 All I have to do is enter my main keywords and it applies common searches which are often excluded from similar campaigns. Pros: It’s free for the first 30 searches. Cons: It’s only free for the first 30 searches.